Those of us who can, reset our body clocks daily. The primary cue from the environment is light. The vast majority of us need to advance our phase, that is, shorten our built-in day to match the light/dark cycle in nature. This is what normal people do so easily. By definition, people with Delayed Sleep-Phase Syndrome (DSPS) can adjust to a 24 hour day, even though they don’t fall asleep before 2-6 a.m. or even later. People with Non-24-hour Sleep-Wake Syndrome cannot of their own accord. M. Uchiyama et al in Japan have studied Non-24 and DSPS people, comparing both with normal controls and with each other. The following table is constructed from two of their reports, published in 2000 and 2002. No blind subjects were included in these two studies. * Both the Non-24 and the DSPS people slept longer than the normal ones. * Non-24 people had a short interval from sleep onset to the melatonin midpoint. * Both Non-24 and DSPS people had a long interval from the core body temperature trough (nadir) to wake-up. * DSPS people had a longer interval between sleep onset and nadir than Non-24 people. We know that normal people are exposed to morning light about two hours after nadir, as that is their “hard-coded” wake-up time. Light exposure is less and less effective in resetting the body clock in the hours which follow. Core body temperature is one marker of an individual’s circadian period. 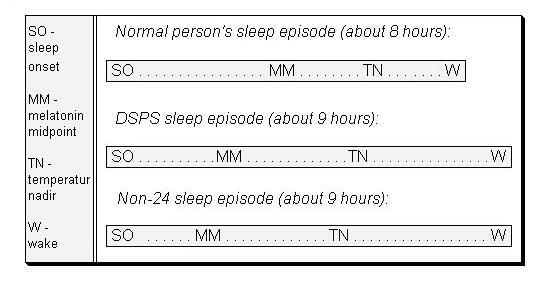 In the table above, which shows an approximation of the intervals reported, one can see that when DSPS and Non-24 people are allowed to awaken spontaneously, their earliest light exposure occurs much more than the normal two hours after nadir. Non-24 patients have a significantly more faulty phase angle between sleep onset and the circadian pacemaker than DSPS patients have. Uchiyama M, Okawa M, Shibui K, Kim K, Tagaya H, Kudo Y, Kamei Y, Hayakawa T, Urata J, Takahashi K. Altered phase relation between sleep timing and core body temperature rhythm in delayed sleep phase syndrome and non-24-hour sleep-wake syndrome in humans. Neurosci Lett. 2000 Nov 17;294(2):101-4. Shibui K, Uchiyama M, Okawa M. Melatonin rhythms in delayed sleep phase syndrome. J Biol Rhythms. 1999 Feb;14(1):72-6. Okawa M, Uchiyama M. Circadian rhythm sleep disorders: characteristics and entrainment pathology in delayed sleep phase and non-24-h sleep-wake syndrome. Sleep Med Rev. 2007 Dec;11(6):485-96. Epub 2007 Oct 25.